I just read a great article about dog seat belts that every dog owner should read thoroughly. Think your pup’s safety harness will protect him or her in a car accident. You are WRONG. The purpose of most pet seat belts is to prevent the pet from distracting the driver. In other words, to stop your dog from leaping into your lap while you are driving 60 mph – as Beau has been known to do. Unfortunately, most dog owners buy seat belts thinking that they are protecting their pet… The good news is that there are some promising ones out there (like the Sleepypod Clickit) and more are being developed. In my opinion – any seat belt is better than no seat belt. What do you think? Does your pet wear a seat belt? Despite good intentions, many owners who are buckling up their dogs may not be using a harness that will keep the animals or passengers safe. Serious flaws were found with many popular car pet restraints in a new study by the Center for Pet Safety (CPS) and Subaru. Only one pet restraint, the Sleepypod Clickit Utility Harness, was able to offer adequate protection to the dog and the passengers of the vehicle, earning it a top score for crash protection. More than 43 million households own a dog, according to the American Veterinary Medical Association (AVMA), and most pooches need to be transported in vehicles, whether for a trip to the vet or a family vacation. To understand the safety that restraints can provide in an accident, the CPS looked at systems that manufacturers claimed were tested, crash tested, or have crash protection, and they designed the test based on FMVSS 213 standard, which is the procedure currently used to certify child safety seats.. The CPS purchased a variety of harnesses and the testing occurred in two phases. Each harness was first subjected to a preliminary strength test and if the harness remained intact during the strength test, it would continue on to the crash test portion of the evaluation. Of the 11 harnesses that claim crash protection, only seven passed the initial strength portion of the test and therefore qualified for the crash test evaluation. 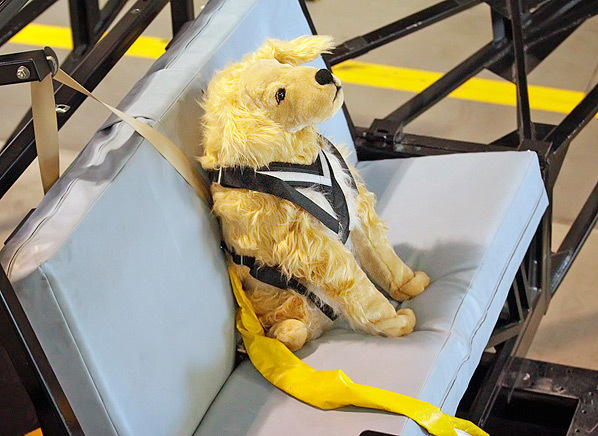 The systems were tested using specially designed crash test dummy dogs in three sizes: a 25 lb. Terrier mix, a 45 lb. Border Collie, and a 75 lb. Golden Retriever. The organization will use the data to help develop standards for performance and test protocols of restraint systems, since there are currently no such industry guidelines. The Sleepypod Clickit Utility was the top performer because the dog remained restrained during every test and was deemed to offer protection to not only the pet, but to all passengers. The other harnesses that were crash tested—Klein Metal AllSafe, Cover Craft RuffRider Roadie, RC Pet Canine Friendly Crash Tested, Bergan Dog Auto Harness, Kurgo Tru-Fit Enhanced Strength, and IMMI PetBuckle—did not have optimal performance in the tests. Some of the harnesses allowed the dog to launch off of the seat or did not control the rotation of the dog. The worst products were labeled catastrophic failures, as they allowed the test dog to become a full projectile or be released from the restraint. That occurred in the IMMI model in all dog sizes, Kurgo in the 25 lb. and 75 lb. size, and the Bergan model in the 75 lb. size. If you need to transport your pet, make sure it is properly restrained so it doesn’t get hurt or possibly injure others in a crash. Further, a proper restraint will reduce the risk of the pet interfering with the driver or otherwise causing distractions with its movement. For more tips on how to safely transport your pet, see our report on pets and car safety . 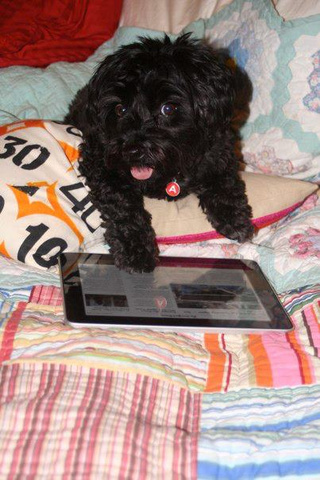 Here is a terrific article from School for The Dogs about Why you should teach your dog to use an iPad. It’s a three-paws up Must-Read! I’ve re-posted some of it here, but read the entire article to learn more about the process and which apps are best for teaching nose touch to your pup! At School For The Dogs , my training partner Kate and I have been doing something kind of silly recently: We’ve been teaching dogs to use iPads. Since then, we’ve shown several dozen dog owners how to manipulate touch screen Apple devices. Today, The Wall Street Journal put up an article and a video about our efforts. I love teaching silly stuff to dogs. It’s something that you can do to spend time with your dog and keep him mentally engaged without the need for a lot of space, time or money. And the more silly behaviors your dog can learn to do reliably on cue, the better he’ll be at understanding you when you need to teach important stuff. “Touch” is one of the first “tricks” we teach dogs in our classes. It simply involves communicating to a dog that he can touch something with his nose, and something good will happen — usually that good thing is the sound of a clicker, which predicts the presence of a small food treat. Teaching a dog that he can affect the outcome of his environment simply by touching something with his nose is a way to build confidence and a way to clue him into the fact that he can get good things out of humans without having to resort to jumping or barking. There are lots of applications for nose touches. If a dog will reliably touch his nose to your outstretched palm, you can quickly build a really good “come” — just hold out your hand, and your dog will go to it. It’s also a way to lead them around a space (they’ll follow your hand). And it’s a step towards teaching them to close doors, or drawers. My training partner Kate, for example, taught her dog Disco to close the door behind her when she is carrying out her laundry. Here he is closing the fridge. Teaching a dog to use an iPad can be a first step towards generalizing the idea of “touch” — he can learn it can work on objects, not just hands. If you’d like to teach your dog to operate your touchscreen device, we will be holding our iDog clinic for four dogs on August 20th at our Gramercy studio. We recommend your dog have a solid hand “touch” prior to class. Signup on our site , or give us a call at 212-353-DOGS. Here is a North Carolina based photographer who has come up with a unique way to help homeless animals find homes and is using her talent behind the camera to raise awareness for these pets in need. Bravo to Shannon Johnstone! You get 4 paws up! Photographer Helps Dogs in Need From Behind the Camera [PICS].